Contact J P Smith & Sons Ltd.
Watch this space! New website coming soon! Time was when a driver was expected to handball twenty tonnes of potatoes off the back of a lorry, manual handling came with the job. Not anymore. With the advant of strict manual handling regulations, responsibility for unloading has moved back to the transport company or the manufacturer of the goods when delivering to sites and factories. J P Smith & Sons saw that lorry-mounted cranes were the obvious way forward to protect their driver's safety and boost productivity into the bargain. 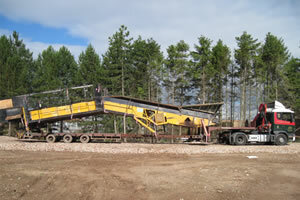 We first developed cranes to unload the goods that we were moving as general hauliers. We were delivering a large amount of building products to housing developments, timber, timber frame houses and numerous amounts of roof trusses. These tend to be difficult to handle - even the smaller ones, so we developed rear mounted Hiab cranes so that we could gain access and lift the trusses safely to the ground. J P Smith & Sons offer far more than just haulage. We get involved in on-site installations and constructions. The larger long reach artic cranes have enough reach to lift the trusses onto the roof from the carrying trailer. We are often called upon to erect the timber frame of a new house. The larger artic mounted cranes are also capable of lifting and unloading site 'containers and porto cabins' and sitting them exactly where required. We regularly move all sorts of machinery - air conditioning units / moulding machines / incinerators / generators / electrical transformers and some abnormal loads. We have in recent, years got involved in the delivering and installation of shop refrigeration equipment on a nationwide basis. This involves working closely with the customers installation crews, often removing doorways / windows and shop fronts to allow us to lift the units into place.